The COP9/signalosome (CSN), a multiprotein complex consisting of eight subunits, is implicated in a wide variety of regulatory processes including cell cycle control, signal transduction, transcriptional activation, and plant photomorphogenesis. Some of these functions have been linked to CSN-associated enzymes, including kinases and an activity that removes the ubiquitin-like protein NEDD8/Rub1p from the cullin subunit of E3 ligases. CSN is highly conserved across species from fission yeast to humans, but sequence comparison has failed to identify the complex in budding yeast, except for a putative CSN5 subunit called Rri1p. We show that disruption of four budding yeast genes, PCI8 and three previously uncharacterized ORFs, which encode proteins interacting with Rrr1p/Csn5p, each results in the accumulation of the cullin Cdc53p exclusively in the Rub1p-modified state. This phenotype, which resembles that of fission yeast csn mutants, is due to a biochemical defect in deneddylation that is complemented by wild-type cell lysate and by purified human CSN in vitro. Although three of the four genes encode proteins with PCI domains conserved in metazoan CSN proteins, their disruption does not confer the DNA damage sensitivity described in some fission yeast csn mutants. Our studies present unexpected evidence for the conservation of a functional homologue of the metazoan CSN, which mediates control of cullin neddylation in budding yeast. 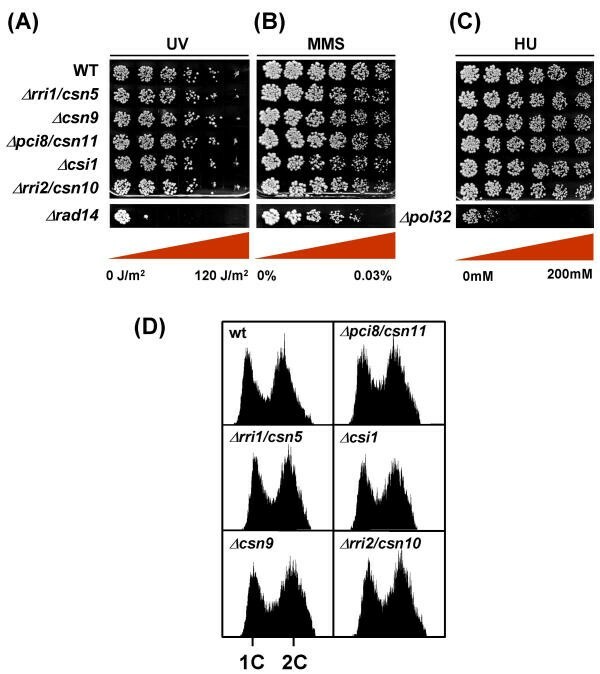 The COP9/signalosome (CSN) was first identified in Arabidopsis thaliana as an eight subunit complex involved in the suppression of light-dependent development . Subsequent studies have led to the identification of similar complexes in other plant species, Drosophila melanogaster, human cells, and fission yeast [2–7], thus indicating a high degree of structural conservation during evolution. Cloning of CSN subunits revealed their structural similarities to the eight subunits of the lid complex of the 26S proteasome [3, 8, 9, 10]. The similarity was most pronounced within the so-called MPN domains of CSN5 and 6 and the PCI domains of the remaining subunits . CSN has been implicated in multiple biological processes, many involving ubiquitin-mediated proteolysis (reviewed in [12, 13]). For example, CSN is required for degradation of the plant transcription factor HY5 by the putative COP1 ubiquitin ligase . In addition, CSN is involved in auxin-induced turn-over of the transcriptional repressor AUX/IAA . This process is mediated by an ubiquitin ligase  related to SCF complexes first identified in budding yeast [16, 17]. All SCF complexes share the core subunits Cdc53p/cullin 1, SKP1, and the RING domain protein HRT1/RBX1/ROC1, which associate with different F-box proteins that mediate substrate specificity (reviewed in ). The discovery that CSN can interact with multiple cullins [7, 19] indicates that it may be a global regulator of cullin-based ubiquitin ligases. Consistent with this possibility, CSN promotes removal of the ubiquitin-related protein NEDD8 from cullins , a modification that stimulates cullin ubiquitin ligase activity in vitro[20–23] and is required for cullin function in vivo. Fission yeast cells lacking CSN subunits accumulate the cullins Pcu1p and Pcu3p exclusively in the neddylated state [6, 7, 19]. Similarly, in human cell lysate, CSN is required to retain CUL1 in the deneddylated state . Remarkably, CSN purified from pig spleen can deneddylate Pcu1p in vitro. Recent studies strongly suggest that the deneddylation activity of CSN is intrinsic to a protease motif in subunit 5 . Despite the remarkable degree of evolutionary conservation of CSN, sequence comparisons have failed to identify the complex in budding yeast with the exception of a putative CSN5 homologue named Rri1p . Similar to fission yeast csn5, disruption of RRI1/CSN5 in budding yeast leads to accumulation of the cullin Cdc53p in the Rub1p/Ned8p-modified state . Since mammalian CSN5 was implicated in numerous signaling pathways apparently independent of the CSN holocomplex (reviewed in ), it remained unclear whether budding yeast Rri1p/Csn5p executes its deneddylation function as a monomeric protein or whether it requires additional factors effectively constituting a homologue of the CSN holocomplex identified in higher eukaryotes. In a recent large-scale survey of budding yeast protein complexes , five proteins co-purifying in a stable complex with Rri1p/Csn5p were identified by tandem mass spectrometry. However, the biological significance of these interactions remained unknown. Here we show that this protein complex has structural and functional similarities to metazoan CSN. Tandem affinity purification and mass spectrometry identified five proteins that stably interacted with budding yeast Rri1p/Csn5p in vivo at endogenous expression levels : (1.) the proteasome subunit Rpn5p/Nas5p [29, 30], (2.) Pci8p, a putative subunit of the translation initiation factor eIF3 , and (3.) proteins encoded by the previously uncharacterized open reading frames YDR179C, YMR025W, and YOL117W (recently named RRI2). Specific interaction of these proteins in a complex is further confirmed by previous data from systematic two-hybrid screens [32, 33] (summarized in Fig. 1B). Pci8p and two of the three novel proteins contain PCI domains and show limited homology to fission yeast CSN subunits in various regions (Fig. 1A and data not shown). As the low degree of homology over the entire length of the proteins renders their assignment to individual metazoan CSN1-8 subunits uncertain, we refer to the previously uncharacterized genes according to a nomenclature proposed by Glickman and colleagues (personal communication). Previously assigned gene names were maintained, but supplemented by the names suggested by Glickman and colleagues, in order to indicate their common function in the budding yeast CSN complex, as documented in this report. The nomenclature used here is summarized in Fig. 1A. Domain structure of budding yeast CSN proteins and csn deletion phenotype (A) Schematic representation of budding yeast genes encoding proteins identified in a stable complex with Rri1p/Csn5p. Conserved MPN and PCI domains are highlighted as red and blue boxes, respectively. Consistent with the typical localization pointed out in the original report , the PCI domains of budding yeast CSN proteins are located in the C-terminus. The table to the right lists the ORF names next to published gene names, and names assigned by Glickman and colleagues (personal communication, denoted by *). (B) Summary of published budding yeast CSN protein interactions. Two-hybrid interactions [32, 33] are indicated by dotted lines, in vivo protein interactions identified by affinity purification of Rri1p/Csn5p interacting proteins  are indicated by solid lines. (C) Effect of deletion of csn genes on Rub1p modification of Cdc53p. The indicated strains were grown in YPD media to an optical density of ~0.8 and total protein lysate was prepared by bead lysis in a buffer containing 20 mM Hepes pH 7.4, 150 mM NaCl, 0.2% Triton X-100, 1 mM EDTA, and 50 mM NaF, 1 mM DTT, 1 mM PMSF, 17 ug/ml aprotinin, 10 ug/ml leupeptin, and 10 ug/ml pepstatin. Lysates were separated on SDS gels and the native and Rub1p-modified forms of Cdc53p were detected by immunoblotting with Cdc53p antibodies (purchased from Santa Cruz Biotechnology, sc-6717). Unmodified and Rub1p-modified Cdc53p are indicated. 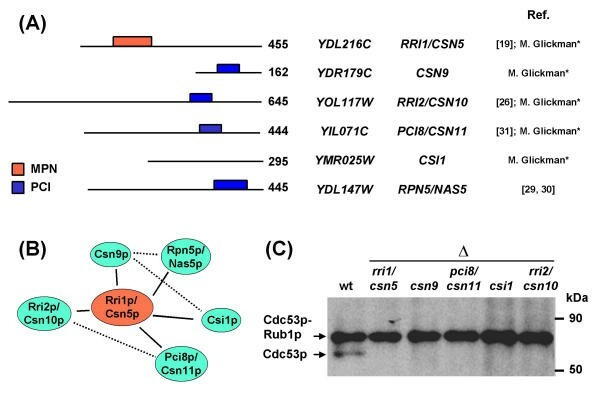 As control of cullin deneddylation is one of the prominent activities of CSN [6, 7, 19, 25], we tested whether Rri1p/Csn5p-associated proteins regulate the modification state of the cullin Cdc53p with the budding yeast Ned8p homologue, Rub1p. Strains individually deleted for RRI1/CSN5, CSN9, RRI2/CSN10, PCI8/CSN11, and CSI1 (referred to as csn mutant strains throughout this manuscript) were obtained and Cdc53p modification was examined by immunoblotting of total cell lysate. Wild-type cells displayed two forms of Cdc53p migrating on SDS gels with different mobilities (Fig. 1C). Although the ratio of the two forms varied somewhat between individual experiments presumably due to slight variations in extract preparation, the faster migrating form represents unmodified Cdc53p, whereas the slower migrating form arises from Rub1p modification, as it was abolished in Δrub1 cells (Ref. and Fig. 2A). Remarkably all five csn mutant strains accumulated Cdc53p exclusively in the Rub1p-modified form (Fig. 1C). Since deletion of RPN5/NAS5, a gene encoding another protein interacting with Rri1p/Csn5p is lethal due to its essential function in the proteasome , its effect on Cdc53p modification was not examined. 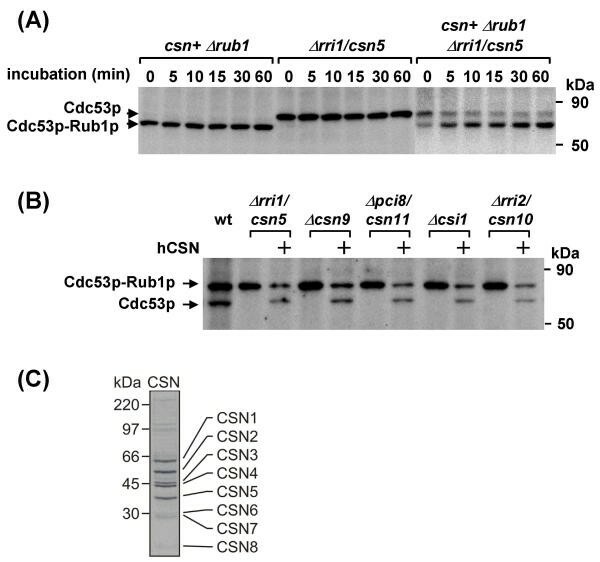 Csn mutants have a biochemical defect in Rub1p removal from Cdc53p (A) Total cell lysate was prepared from CSN containing Δrub1 and csn deficient Δrri1/csn5 strains according to the protocol described in Fig. 1C. Individual lysates (lanes 1–12) and a 1: 2 mixture of the csn + Δrub1 and Δrri1/csn5 lysates (lanes 13–18) were incubated for the indicated times (0–60 minutes) at 30°C, followed by immunoblotting with Cdc53p antibodies. Unmodified and Rub1p-modified Cdc53p are indicated. (B) Total cell lysate of the indicated csn mutants was prepared as described in Fig. 1B and incubated with 150 ng of purified human CSN complex for 2h at 30°C. The effect on Cdc53p modification was assessed by immunoblotting as described in Fig. 1C. Unmodified and Rub1p-modified Cdc53p are indicated. (C) Coomassie blue stained gel showing the purified human CSN preparation used in the experiments in Fig. 2B. Human CSN was purified as described , and individual subunits as determined by immunoblotting and mass spectrometry are indicated. To determine whether budding yeast csn mutants exhibited a biochemical defect in the removal of Rub1p from Cdc53p similar to fission yeast csn mutants, we tested whether the readdition of cell lysate containing wild-type budding yeast CSN could rescue the Rub1p removal defect of csn deficient cell lysate. Total protein lysate from csn + and Δrri1/csn5 cells prepared in the absence of exogenous ATP was incubated at a ratio of 1:2 for up to 60 minutes at 30°C, and Cdc53p modification was assessed by immunoblotting. To exclude readdition of Rub1p to unmodified Cdc53p during the incubation, the csn + lysate was prepared from rub1 deletion strains as a source of functional CSN proteins. As previously described , Δrub1 cell lysate contained unmodified Cdc53p and no change in Cdc53p modification was observed upon incubation of this lysate for up to 60 minutes (Fig. 2A lanes 1–6). Likewise, incubation of Δrri1/csn5 lysate alone did not result in removal of Rub1p from Cdc53p over the 60 minute time course of the experiment (Fig. 2A, lanes 7–12). When csn + Δrub1 and Δrri1/csn5 lysates were denatured in SDS sample buffer prior to mixing, the expected ratio of 1:2 was observed for Cdc53p/Cdc53p-Rub1p (Fig. 2A, lane 13, time point 0 minutes). In contrast, when native lysates were co-incubated at 30°C, the ratio reversed within 5 minutes, indicating complementation of the Δrri1/csn5 Rub1p removal defect by a functional CSN present in Δrub1 lysate (Fig. 2B, lanes). Identical complementation by Δrub1 lysate was obtained with several other Δcsn mutants (data not shown). These data show that, similar to fission yeast csn mutants, budding yeast Δcsn strains have a biochemical defect in the removal of Rub1p from Cdc53p, suggesting that the Rri1p/Csn5p, Csn9p, Rri2p/Csn10p, Pci8p/Csn11p, and Csi1p complex represents a budding yeast equivalent of the CSN complex described in fission yeast, plants, and human cells. To substantiate this conclusion, we tested whether human CSN could complement the Rub1p removal defect of csn mutant cell lysates. Human CSN highly purified from erythrocytes (Fig. 2C; ) was added to cell lysate prepared from all five csn mutants, and Rub1p modification of Cdc53p was assessed by immunoblotting. Addition of human CSN to csn deficient budding yeast cell lysate restored the ~1:1 ratio of modified to unmodified Cdc53p observed in wild-type cells, indicating efficient removal of Rub1p from Cdc53p in vitro (Fig. 2B). These results strengthen our conclusion that budding yeast csn mutants are deficient in a biochemical activity equivalent to human CSN. While all five CSN proteins examined here are clearly involved in CSN-dependent cullin deneddylation, it is presently unclear whether they represent all subunits of the budding yeast CSN, in particular as all other known CSN complexes contain a minimum of eight subunits. It is equally unclear whether all five CSN proteins characterized here are part of the same complex. Although the budding yeast genome does not encode clearly discernible MPN or PCI domain proteins other than proteasome lid subunits and the CSN proteins characterized here (data not shown), it is possible that some of them dimerize to assemble a larger CSN complex. Alternatively, MPN and PCI domain containing proteasome lid subunits may substitute for authentic CSN subunits in budding yeast, thus giving rise to an eight-subunit complex. In support of this notion, Rpn5p/Nas5p, one of the non ATPase components of the 19S lid carrying a PCI domain that shares high homology with CSN4, was also found in the Rri1p/Csn5p complex isolated by tandem affinity purification . Similarly, Pci8p/Csn11p was previously shown to associate with eIF3 in budding yeast , suggesting a potentially complex pattern of CSN/eIF3/proteasome interactions. Further biochemical studies will be required to unravel this complexity and to reveal the exact stochiometry of the budding yeast CSN. Studies in fission yeast implicated the PCI containing Csn1p and Csn2p, but not other CSN subunits [6, 7], in a pathway required for the normal response to DNA damage and proper execution of S phase . These defects lead to cell elongation, slow growth, and sensitivity to UV, but not hydroxyurea (HU) . To examine whether these phenotypes are shared by budding yeast, all csn mutants were exposed to increasing doses of UV, the alkylating agent methyl-methane sulfonate (MMS), and HU. As shown in Fig. 3A,3B,3C, none of the budding yeast csn mutants were sensitive to either treatment. In addition, flow cytometric measurement of the DNA content in csn mutants did not show the accumulation of S phase cells characteristic of fission yeast csn1 and csn2 mutants  (Fig. 3D). These results indicate that the S phase and DNA damage response functions of CSN, unlike the deneddylation function, are not conserved among both yeasts. Since budding yeast lacks clearly identifiable homologues of csn1 and csn2, apart from their conserved PCI domains, it is possible that these proteins evolved specific domains required for these functions in fission yeast. Effect of DNA damaging agents and hydroxy urea on csn deletion strains (A) 102 cells of csn mutant strains were spotted onto YPD plates followed by irradiation with the indicated doses of UV light (0 – 120 J/m2). The UV-sensitive Δrad14 strain was used as a positive control for the effect of UV. (B) 102 cells of csn deletion strains were spotted onto a YPD gradient plate containing 0% to 0.03% methyl-methane sulfonate (MMS) as indicated. Plates were incubated for 3 days at 30°C. The MMS-sensitive strain Δrad14 is shown as a positive control for the effect of MMS. (C) 102 cells of csn deletion strains were spotted onto a YPD gradient plate containing 0 to 200 mM hydroxyurea (HU) as indicated and cell growth was determined after incubation for 3 days at 30°C. The HU-sensitive strain Δpol32 is shown as a positive control for the effect of HU. (D) The indicated wild-type and csn deletion strains were grown in YPD to an optical density of ~1, followed by fixation in 70% ethanol. Cells fixed for 24 h at -20°C were washed once in 50 mM sodium citrate and resuspended in the same buffer containing 100 ug/ml preboiled RNAse A, followed by incubation at 37°C for 2 h. Propidium iodide was added to a final concentration of 4 ug/ml, and the cellular DNA content was determined by flow cytometry. Our previous studies in fission yeast and the present studies in budding yeast showed that, apart from the S phase and DNA damage defects of fission yeast csn1 and csn2 mutants, the cellular phenotypes of yeast csn mutants are surprisingly unremarkable. In fact, no other gross growth or morphological phenotypes have been detected, despite the presence of maximally neddylated cullins in all yeast csn mutants examined (data not shown). Control of cullin deneddylation is therefore the only generally conserved biochemical function of CSN identified to date. In contrast, CSN has major developmental functions in multicellular eukaryotes, including D. melanogaster  and A. thaliana (reviewed in ), although it is presently unclear whether any of these are linked to CSN-mediated deneddylation. While no substrates of the Rub1p/Ned8p modification system other than cullins have been identified, fission yeast csn1 mutants expressing tagged Ned8p accumulate several other proteins reactive with anti-tag antibodies . No major cellular pathway of unicellular organisms seems to be disturbed by hyperneddylation of these substrates, but their existence extends the biological functions of CSN to a potentially wider array of cellular processes. The unexpected conservation of the budding yeast CSN revealed in this report will offer novel opportunities for deciphering these functions in a simple, genetically and biochemically tractable organism. Our study provides evidence for a budding yeast CSN complex containing MPN and PCI domain proteins, which mediate cullin deneddylation, the primary conserved function of the metazoan CSN complex. We thank G. Cope, R. Deshaies, M. Glickman, and V. Maytal for sharing results prior to publication, and L. Samson for providing all budding yeast deletion strains used here. This study was funded by NIH grant GM59780 to D.A.W., by the NIEHS Center grant ES-00002, and by a grant from the German Israel Foundation to W. D.. S.W. is the recipient of a stipend from the NIH training grant ES-07155. All experiments were performed by S.W., except for Fig. 3D, which was performed by D.A.W. B.H. purified the human CSN used in this study. W.D. and D.A.W. participated in the design of the study and its coordination. All authors have read and approved the final manuscript.